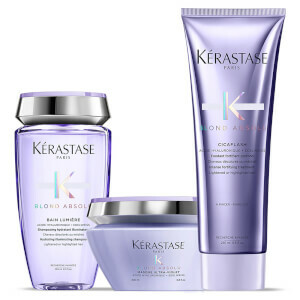 Restore the vibrancy of blonde hair with Kérastase Blond Absolu Ultra Violet Shampoo, Masque and Conditioner Trio; a three-piece set of haircare treats formulated specially for blonde tresses. Designed to fend off unwanted brassiness for icy cool blonde locks, the trio work in synergy to cleanse, treat, nourish and fortify for silky-smooth hair that shines bright. A weightless and luxurious formula that delivers the deep nourishment of a hair mask. The shimmery gel is infused with Hyaluronic Acid and Edelweiss Flower to replenish intense hydration to every strand, rebuilding and strengthening the fibre to minimise breakage. 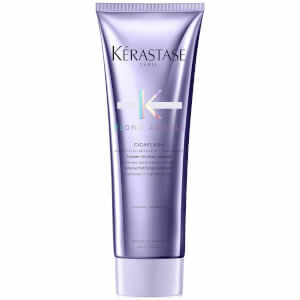 The conditioner helps to create smoother, softer and silkier hair with a radiant finish. Shampoo: Wet hair then thoroughly remove excess water before applying a quarter-sized amount of shampoo touch by touch onto 5 key zones of the hair. Add water and emulsify. Leave it on between 2 to 5 minutes. Rinse thoroughly. We recommend you to alternate with Bain Lumière on a weekly or as a second shampoo for a deeper & hydrating cleanse. 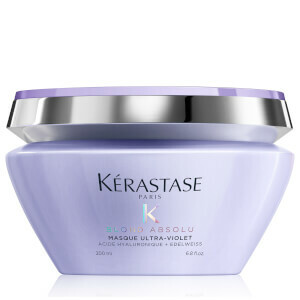 Masque: Apply on washed and towel-dried hair. Massage onto lengths and ends. Leave-in for 5 minutes for light neutralisation or longer (up to 10 minutes) for stronger neutralisation. Add water, emulsify and rinse thoroughly. 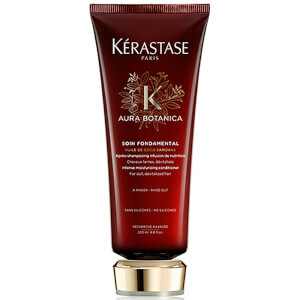 Treatment: Apply a hazelnut sized amount on washed and towel-dried hair. Massage through mid-lengths and ends, avoiding roots to ensure lightweight volume. Leave in for 2 to 3 minutes. Emulsify and rinse thoroughly. Treatment: Aqua / Water, Cetearyl Alcohol, Amodimethicone, Hydroxypropyl Starch Phosphate, Isopropyl Myristate, Behentrimonium Chloride, Phenoxyethanol, Trideceth-5, Isopropyl Alcohol, Trideceth-6, Glycerin, Peg-150 Distearate, Caprylyl Glycol, Trideceth-10, Limonene, Cetrimonium Chloride, Citric Acid, Sodium Hyaluronate, Serine, Tocopherol, Acetic Acid, Ci 60730 / Ext. Violet 2, Leontopodium Alpinum Flower/Leaf Extract, Malva Sylvestris Flower Extract / Mallow Flower Extract, Sodium Benzoate, Potassium Sorbate, Parfum / Fragrance. C224142/1.